At work we often use the Port Querycommand to test connectivity to services running on servers. We have a bunch of firewalls scattered all over the place and most of the time issues with Lync are due to firewall updates not having been made. The advantage to PortQry is that it can probe for UDP ports as opposed to just TCP ports that the built-in Windows Telnet client can test. I don’t have time to memorize the command line switches for every command I run. Fortunately, there is also a GUI version of PortQry called PortQueryUI. (Note that Microsoft documentation refers to this as PortQryUI but the name of the executable is PortQueryUI. For readability purposes, I will use the latter.) Aside from not having to memorize any command line parameters, PortQueryUI let’s you easily run standard tests by selecting them from a drop down list. It’s easy enough to figure out how to add your own entries. 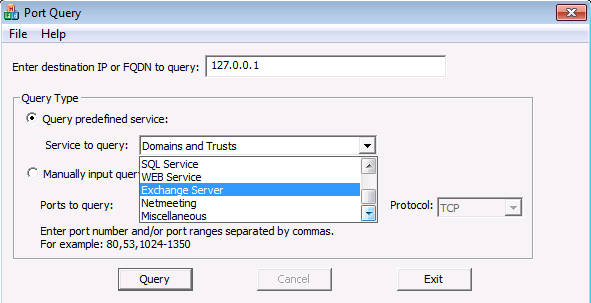 Simply create a new Service Name entry and under that define the ports you want to query. So I went ahead and created a bunch of these Service Names for all manner of Lync communication – 22 in total. I based my work off the very useful Windows Phone app Lync Protocol&Ports. Click here to download the config.xml and then just copy it over the config.xml that comes with PortQueryUI. Most likely I missed some ports and some options. Feel free to leave a comment and I’ll update the file with the corrections. ~ by flinchböt on 2013/05/10. I released a new version of my script, which includes an automated installation of this. Nice work!